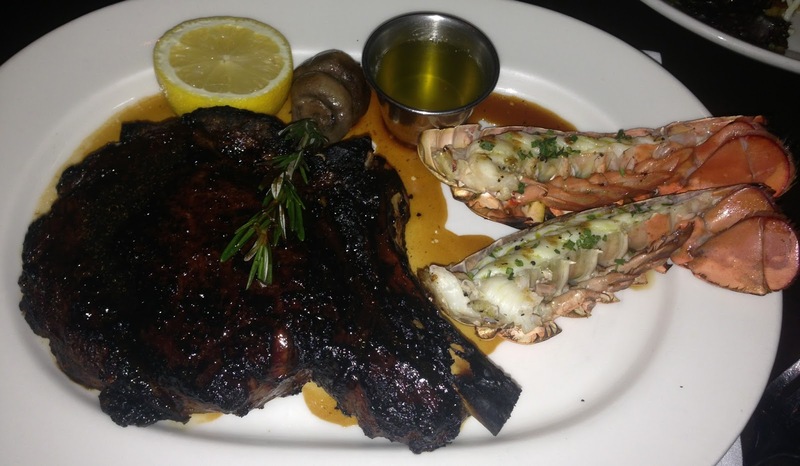 I recently dined at N9NE Steakhouse at the Palms Hotel in Las Vegas. It is now one of my new favorite steakhouses. I’ve always heard that it was good, but I was blown away. Mastros Steakhouse has always been my favorite, but I don’t know now….N9NE definitely gave it a good run for its money. If you are looking for a nice restaurant in Vegas, you have to go to N9NE. Check out my reviews on the food below! A great crab cake! Loved the avocado dressing with it too, I’ve never had a crab cake with an avocado sauce before which made it unique. This picture doesn’t really make the soup look good lol, but it was a good lobster bisque. It was sweet, and there were nice size chunks of lobster in it. I love tuna tartare as an appetizer because it’s light, especially before a heavy steak dinner. This was fresh and flavorful. I loved how it had a lot of avocado and the sauces added a nice kick too. It’s the perfect appetizer in my opinion, and this was a good one! This steak was up there in one of the best steaks I’ve ever had. We ordered it charred, (I recommend always getting your steak charred, it adds flavor), and the flavor was incredible. Every bite was amazing. It was buttery (but not too buttery), had great seasoning, and the meat was cooked perfectly. It melted in your mouth. I will definitely go back next time I’m in Vegas just for the steak. I always get creamed spinach as a side when I order steak. This one was delicious. I loved the baked Parmesan gratin on top, and the smoked bacon added great flavor. Loved it. Omg. Every bite was heaven. I never really order creamed corn, but since I’ve tried this I will now be ordering it as side dish with my steaks from now on. It was sweet and creamy and it just complimented the steak so well as a side dish. I’ve had creamed corn before which I’ve always liked, but there was something about this one in particular that really stood out for me. Delicious! Next PostSUMMER 2013 DINELA WEEK!